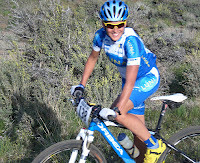 Katerina Nash, from Truckee, placed 14th in the Olympic mountain bike cross country race today. Four women went off the front early in the race. The four women gapped the field, but Nash fought hard to chase them down. At lap two of the 6 lap race, Nash was seconds behind the leaders. The first 4 riders continued to stretch their lead and eventually Nash faded. Julie Bresset, from France won in a time of 1hour 30 minutes and 52 seconds. Nash finished 5 minutes, 30 seconds back. Nash was riding for her native country, Czech Republic. Nash has lived in this country for about 10 years.